Do you suffer from intense burning and stabbing pain, stiffness, or swelling in your hand and have also noticed discoloration of the hand, arm or leg? These signs and symptoms may be caused by Complex Regional Pain Syndrome (CRPS), also called Reflex Sympathetic Dystrophy (RSD). Do not wait a moment longer to visit Dr. Eyad Alsabbagh, who, as the medical director of Pain Management and Spine Care, provides the highest quality of service to patients suffering from multiple conditions, including back pain and narcotics addiction. 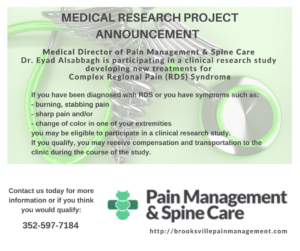 Most recently, Dr. Alsabbagh has begun participating in a clinical research study developing new treatments for Complex Regional Pain Syndrome in Brooksville (RSD treatment Brooksville). Complex Regional Pain Syndrome (CRPS or RSD) is a chronic pain condition, i.e., one that lasts more than 6 months, which occurs mostly after an injury. This syndrome usually affects one limb, such as a hand, arm, leg or even foot, but it can also appear in other areas of the body. Experts believe that CRPS occurs as a result of damage and dysfunction in the central or peripheral nervous system. In exceptional cases, it develops after surgery, a heart attack, or another medical problem. How is CRPS treated? RDS Treatment in Spring Hill and Brooksville. Complex Regional Pain Syndrome is difficult to diagnose, as there is not one specific test that can be used to diagnose it, and many criteria must be satisfied across several categories for it to be identified clinically. Nevertheless, Dr. Alsaggabh’s pain management clinic in Brooksville and Spring Hill is expert in assessing and treating pain and can offer you unique and effective CRPS treatment (RSD therapy Brooksville) options. 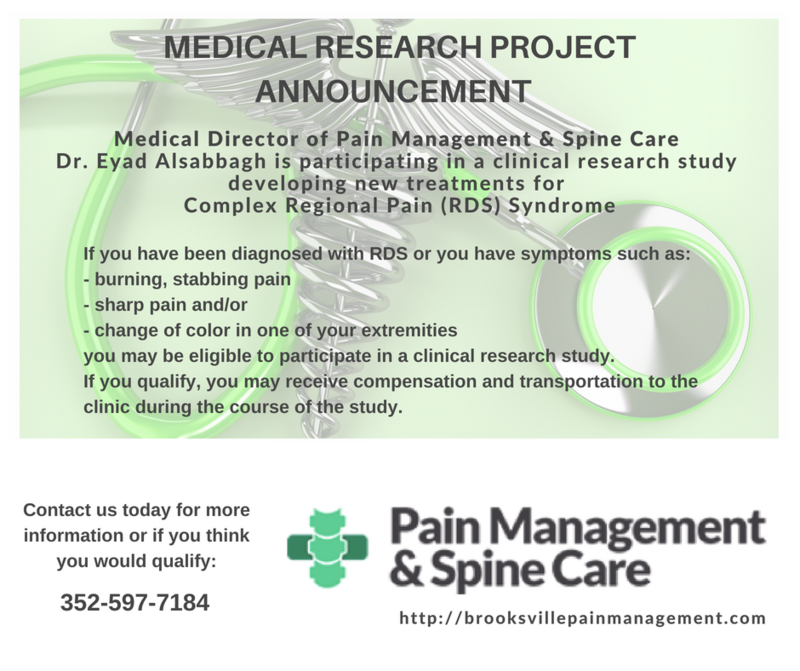 If you would like more information about Complex Regional Pain Syndrome treatment in Brooksville, please Contact Us.